learned early on - if I think I'm going to want dessert, I'd better bring some myself. This gluten free apple cake is a new addition to my collection. 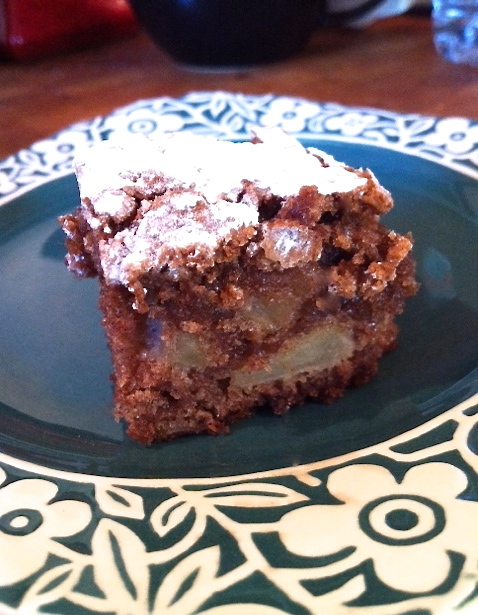 I adapted if from an old apple cake recipe I had in my file box. One of the great things about this cake is that it is not made from a mix. People are always shocked to find out it's not only gluten free, but has buckwheat flour in it too! You'd never know. It's definitely a winner! Preheat oven to 350. Beat sugar and eggs together until thick and light. the apple mixture. Pour into oiled and floured 9 inch square baking pan. Bake 45 minutes or until done. (time may be less). Cool and sift powdered sugar over the top before serving. Can also be served with ice cream. This recipe also makes great muffins.